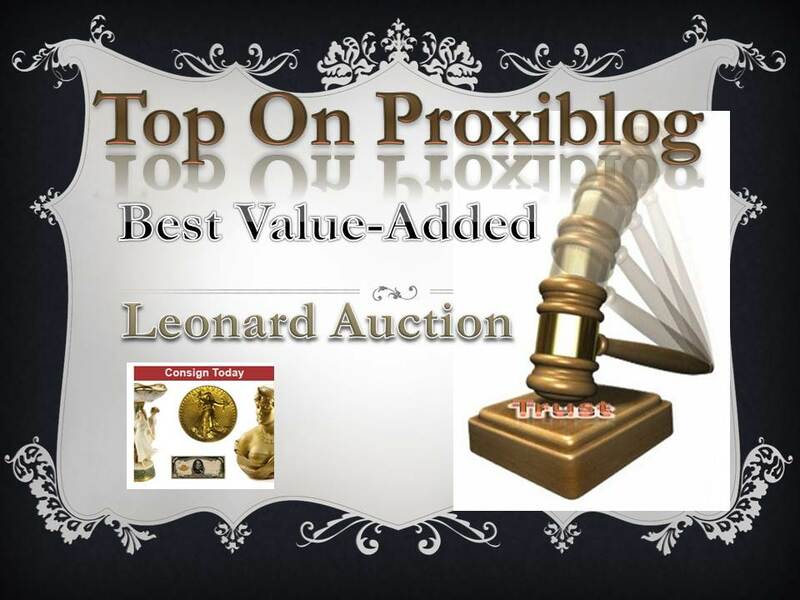 Leonard Auction, operated by John Leonard of Addison, Ill–yet another top-ranked house through much of 2012 on Proxiblog–has won the category of “Value Added,” based on factors often overlooked by bidders, including superior grading, guarantees on authenticity, quality consignments and customer service. To begin with, Leonard Auction “guarantees all items to be genuine (authentic) as to date and mint mark. If a successful bidder has questions as to the authenticity of a lot, the bidder must contact Leonard Auction, Inc. within three (3) calendar days of receipt of the lot.” This is from the company’s terms of service. We also have found John Leonard very responsive whenever we have made an email query. Typically he responds within one or two business days. John Leonard is both numismatist and auctioneer. His onsite house has more than 8000 square feet of showroom and office space. As the picture below shows, it is a first-class facility for appraisals and lot inspection. Moreover, Leonard Auction secures some of the best consignments because of its fee policy of 0% seller fee for lots that sell at $250 or higher. Better still, John has strict guidelines on reserves and has to agree with the seller on any reserve before placing it on a lot. You can download his consignment form here. Proxiblog has consigned coins with Leonard Auction in the past and so knows from experience that the auction house relies on advertising, marketing and onsite and floor competition to reach wholesale and often retail levels for lots in addition to sell-throughs. Leonard uses full color catalogs, advertising and select mailing lists, Internet marketing and online/onsite auction previews. A close second to Leonard Auction was Capitol Coin Auction and Weaver Signature Coin and Currency Auction, which utilize many of the above features and methods. John Leonard’s expertise as both numismatist (known to coin dealers across the nation) and auctioneer (member of the Illinois State Auctioneers Association and the Certified Appraisers Guild of America) gave the slightest edge to his house. In our opinion, Brad Lisembee of Capitol and Dave Weaver of Signature Coin and Currency have similar reputations. Other houses with superior customer service and other amenities include Honorable Mentions Fox Valley Auction, Engstrom Auctions, Jewelry Exchange, Rolling M Auction, Star Coin and Currency, SilverTowne and Western Auction. This entry was posted in TOP Awards and tagged American Numismatic Association, Auctioneers, AuctionZip, Best Practices, Capitol Coin Auction, Coin Auction, Fox Valley Auction, Jewelry Exchange, john leonard, Leonard Auction, National Auctioneer Association, Proxibid, Proxiblog, Rolling M Auction, SIlvertowne, Star Coin and Currency, Weaver Signature Coin and Currency, Western Auction. Bookmark the permalink.